In a tear-jerking display of loyalty, a faithful dog in China has refused to leave his late master's graveside even after going seven days without food. Just like Edinburgh's legendary Greyfriars Bobby, the little Scottish terrier who visited his master's grave every day for 14 years, the faithful yellow dog simply cannot bear to be parted from his friend. 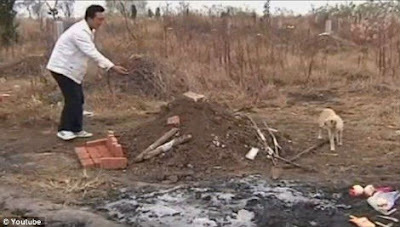 His owner Lao Pan, who died aged 68, earlier this month, lived alone in a little house in the village of Panjiatun in the Liaoning Province with just the dog for company. 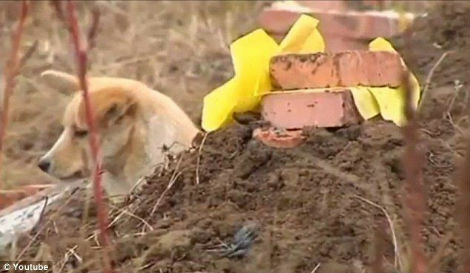 After seven days without a meal, concerned villagers begun bringing food and water to the graveside and even plan to build a little kennel for the dog to curl up in at night. One villager told how he decided to adopt the dog and brought him back home but he immediately escaped and rushed back to be close to his late master. it's so heart wrenching. animals are not dumb, they are much more loving and compassionate than we humans are. Reminds me of Hachiko, a true story of a dog in Japan. The dog waited for its owner at the railway station everyday for 9 years. Thanks for sharing, Robert! Sound like you are also another dog's lover. We speak the language of kindness for sure my dear. my blog is on [url=http://cheapfamilyvacations.blogspot.com/]family vacation ideas[/url]. Thank you for taking the effort.